Voters are just supposed to accept that unless Republicans win an election by an insuperable margin, the Democrats will steal it. Hey! I have an idea! Why doesn’t CNN rustle up some reporters to go and investigate the biggest story of the year? No, the burden is on random Republicans — who have jobs other than “reporting the news” — to produce bulletproof evidence of voter fraud. 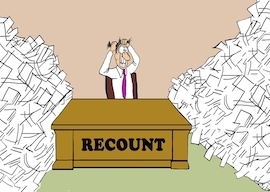 Otherwise, it’s just a wacky coincidence that these “recounts” always result in mysterious new votes for Democrats. If a freelance investigative reporter like James O’Keefe actually does produce the evidence that our media are too lazy and biased to get for themselves, they sneer that O’Keefe can’t be trusted. He’s not a real reporter! We called the Brennan Center for Justice, and they assured us that voter fraud doesn’t exist. I can prove I called — I’ll show you my phone records! We’re not going to send our reporters on a snipe hunt. Oh, and we also got an interesting brochure on voter suppression, such as the Nazi-inspired idea that voters should know how to spell their own names. That’s what we get from our crackerjack media. Journalists’ phones should be taken away, so they’d be forced to do actual reporting.